It’s no secret I’m very excited for Rogue One this winter. While the movie can’t come soon enough, in the meantime I thought I would whet my appetite with the prequel novel that’s meant to portray events that take place in the preceding years. 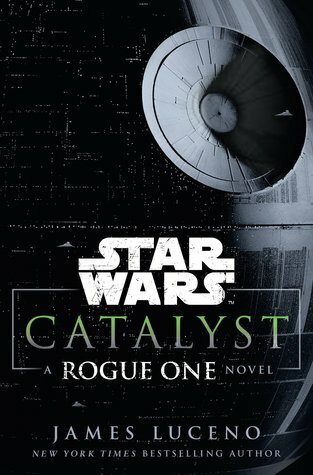 In case you’re wondering whether you need to read Rogue One: Catalyst before seeing the movie though, the answer is: Only if you want to. Like most Star Wars novels in the expanded universe, I would not consider it required reading, and might even recommend against making this your first Star Wars novel if you’ve not read any before. But if on the other hand you’re the kind of “big picture” reader who appreciates a good background story, then this book will likely put some of the movie’s events into context and enrich your experience when you watch it. Opening soon after the end of Episode II: Attack of the Clones and into the early years of the Clone Wars, Catalyst tells story of Galen Erso and Orson Krennic, both of whom will be featured in the upcoming film. A long and complicated history exists between the two men, and James Luceno seeks to explore this relationship by putting strong emphasis on the characters. First, there’s Galen, an energy scientist working on harnessing power from crystals. He and his wife Lyra are soon expecting the birth of their daughter (Jyn Erso, the lead of Rogue One) when Separatists take over the planet they are settled on, imprisoning Galen because of his refusal to work for them. However, the family is soon rescued by Orson Krennic, an old friend of Galen who appears to have made quite a name for himself in Palpatine’s new government. Krennic is now on a team working on a top secret weapons project codenamed “Celestial Power”, which of course is the Death Star. Years pass, and with the fall of the Republic, work on the project Celestial Power has become more crucial than ever to the burgeoning Empire. Hoping to recruit Galen to the program and win favor from the Emperor, Krennic is not above manipulating the scientist by offering him a brand new research facility and the promise of kyber crystals. Dedicated only to his work, Galen is uninterested in taking sides in the war (which incidentally was how he ended up being imprisoned years before), but long has he wanted to use kybers for his research. Because the crystals had been under the purview of the Jedi, obtaining them had been an impossible feat, but now that the Jedi Order has been destroyed, they no longer pose an obstacle. Wary of Krennic and the Empire, Lyra fears that Galen might be heading down a path he’ll regret. Her husband is too blinded by his obsession with research to see what his old “friend” is trying to do, and it is tearing their family apart. Primarily centered on the construction of the Death Star, Catalyst is heavily focused on the logistics and science behind putting together the huge space station. We’re also given more information than we’ve ever had before about the mysterious Force-attuned kyber crystals that Jedi use to build their lightsabers. If you’re interested in details like that, great! If not, then all of this will probably feel a bit dry. The info dumping was especially noticeable in the first half of the book, which unfortunately is when strong pacing is needed the most. The story takes a while to get started, and even as we move through the various developments in the novel, the tone of it remains relatively understated. This is in contrast to some of the more adventurous, action-oriented novels in the new Star Wars canon which might serve as a better jumping on point for newcomers to the books. Catalyst with its themes of intrigue, machinations and plotting might feel a little too slow and underwhelming in comparison. That said, they couldn’t have tapped a more perfect author to write this novel. I’ve always felt that Luceno excels when it comes to the more low-key Star Wars stories due to his attention to detail and thoughtful approach to writing about darker, more subtle themes. From reading Darth Plagueis and Tarkin, I know that he is also fantastic with his characterizations, and of course he is once again at the top of his game with Catalyst. For this story to work, the reader had to be convinced of the unique and complex dynamic between Galen and Krennic. In spite of the other side plots involving Lyra, Jyn and Dressellian smuggler Captain Has Obitt, the book’s main conflict always came back to the relationship between the two men. To make sense of it all, we first had to understand what made each of them tick, and Luceno did an excellent job in that regard. In the end, I thought Catalyst was good but not great. If you’re just starting to check out Star Wars fiction, there are probably better books in the new canon to read first, and unless you have a pressing need to learn all you can about the construction of the Death Star, you could probably put this one on the lower priority pile. That said, it’s still worth reading if you plan on seeing the Rogue One movie, if nothing else to gain a better understanding of the characters and story. Audiobook Comments: I do love my Star Wars books in audio. No other kind of production gives me that epic experience complete with music and sound effects, and other than maybe Marc Thompson, I can’t think of another Star Wars audiobook narrator who is as fun and amazing to listen to as Jonathan Davis. If you’ve ever heard him do his Darth Vader voice, you’d understand. Too bad he doesn’t get the chance to do so in Catalyst, but he nevertheless delivers a fantastic performance, giving every character a unique voice. I never turn down the chance to listen to a Star Wars book, and this was another great one. Keep up reviews like this and I might even consider reading some of the New Canon. I’m really enjoying the new canon. For the most part, the quality of the writing and stories is a huge improvement over the now Legends EU. I’m glad that you liked this one. But I think I’ll skip it lol. As fascinating as building the death Star sounds (yawn) I prefer more Jedis in my Star Wars novels. I am curious about the characters from the new movie, but I know I’ll just be bored by this. Thanks! I am actually curious about light sabers and the Death Star construction, but probably not enough to read this:-) I am excited about the movie, though! They have some really great, really talented narrators doing the Star Wars novels! Especially Star Wars audiobooks – they are a treat. And I would say that’s exactly how I would recommend this to others 🙂 If you enjoy the movie and afterwards would like some more background, then this is perfect!